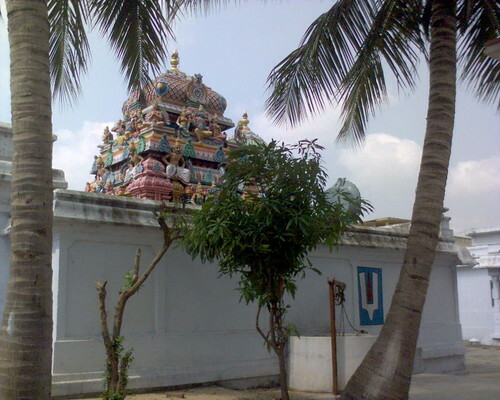 Thirupullani, Pullaranyam also known as Dharbasayanam is one of the important Vaishnavite shrines, about 8 km. away from Ramanathapuram, south-east of Ramanathapuram railway station. The shrine has the distinction of being sung by Thirumangai Alwar in 20 verses. 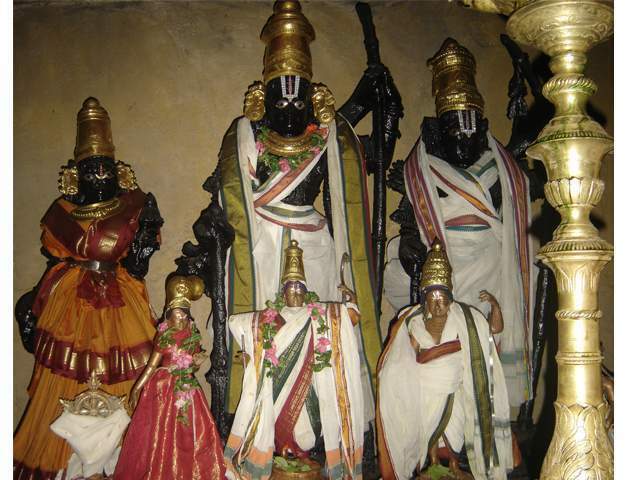 The presiding deity is Sri Adi Jagannatha Perumal who resides here with Padmasini Thayar. 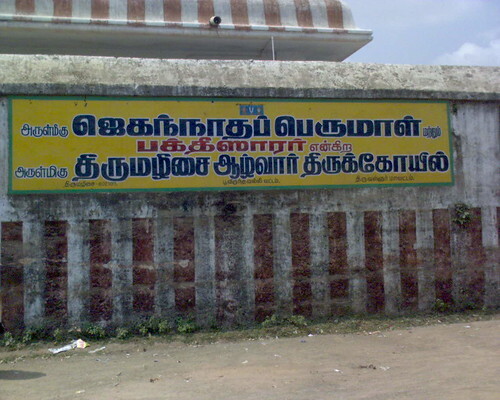 The Tamil name Thirupullani is made of three parts. Thiru-pull-ani. A bed made of grass. 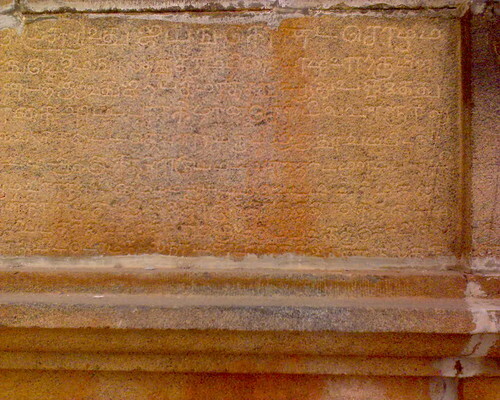 Dharbasayanam is the Sanskritic equivalent of the Tamil name. This place was once a marsh where there was a wild growth of the Kusa grass, or dharbai which is considered to be the holiest of all grass. The shrine takes its name Pullaranya, a forest of grass, from this fact. Thousands of centuries ago, three maharshis, Pullavar, Kalavar and Kannavar performed severe penance on Lord Mahavishnu sitting on the Darba grass. The Lord gave darshan to the Rishis in the form of an Arasu tree. Though they were happy to have the darshan of the Lord in the form of Arasu Tree they begged him to show them His original form. The Lord obliged and appeared as Adhi Jagannatha Perumal. This is the present Thirupullani. It is here king Dasaratha also received the Puthra Bagya Mahamantra and had Rama as his son. Puranas ascribe different reasons for the wild growth of Kusa grass in this particular spot. There is a version which says that Lord Vishnu assumed the form of the 'Divya kUrma' tortoise which form Lord Vishnu assumed to hold the Manthara mountain that was used as churner in place, on His hard, rock-like shell. When the mountain was turned over and over again on His back in the efforts to churn the Ocean of Milk several hundreds of strands of hair on the shell of the Divya kUrma fell off due to the friction and were washed ashore and with the passage of time, they turned into Kusa grass. The story goes on. When nectar was churned out of the ocean, Lord Vishnu assumed the form of a damsel, Mohini, and distributed it among the celestials. Several drops of nectar fell on the ground when it was distributed and also when it was consumed by the Devas. Such drops fell on the 'dharbai' or Kusa grass and therefore the grass is considered sacred. In fact, it is considered as a part of Vishnu himself. The eighth day of moon in the month of Badra (September) is observed as Darbha Ashtami and is an annual festival in this shrine. Thirupullani has the special distinction of having visited by Rama twice - before going to and when returning from Lanka. It was here that he is believed to have reclined in meditation for three days, invoking Varuna. The large army of Vanaras reached the tip of the continent and looked to Rama for devising a way to cross the ocean. Vibishana, who had by that time crossed over to the side of Rama suggested that Rama should meditate on Varuna, the Lord of the Sea and seek his permission to cross the ocean. Rama lay in meditation for three days on the bed of grass and hence the name Thiru-pull-ani, or Dharba-sayanam - reclining on the (bed of) grass. 'tharuNa mangayai mItpadhOr neri tharuga,' sings Kamban of this moment. 'Show me a way to cross you to retrive Sita from the hands of Ravana.' 'ennum poruL nayandhu,' with that sole purpose in his mind, 'nal nUl neri' as prescribed in the Books 'adukkiya pullil' over a bed made of grass, 'karunai am kadal kidandhanan,' He, the ocean of mercy, rested on it 'karum kadal nOkki' facing the blue sea. And after three days, Rama loses his patience, takes his bow in hand which makes Varuna come running to him. He agrees to remain as still as possible to enable the construction of the bridge, Sethu, over the ocean to Lanka. It was at this moment that Adi Jagannatha Perumal, the presiding deity of the temple appeared before Rama and handed him the divine bow. 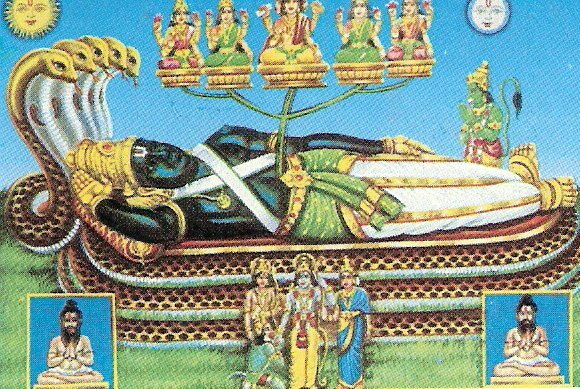 The imposing image of Lord Vishnu reclining on Adi Sesha is awe-inspiring. When returning from Lanka, Rama after installing the Rama-linga at Rameshwaram, visited this shrine once again, the 'adi sethu', and it is here he is said to have had his holy dip to rid himself of the 'brahma-hatya-dhosha' of killing Ravana. Since this was the place where Vibishana was accepted without a question by Rama, this shrine is also celebrated as 'sarana-gathi sthala'. Majority of the devotees throng the temple seeking boon for children. Bathing in the Sethu Theertham relieve the devotee from the sins of the past birth and they are relieved of the adverse effects of the planets. Offering Sari to mother goddess, Tulsi garlands to Perumal, feeding the visitors, distributing the nivedhana to the visitors are followed as prayer commitments here. The rich ones offer liberal donation for the maintenance of the temple. For those seeking child boon. They should have a dip in the Sethu Theertha and should do abishek (bathing the idol) to the Nagar given from the temple. They have to fast throughout the day. They have to stay in the temple in the night. Next day they should install the Nagar (snake idol) in the proper manner. Should do the puja for the child boon and should take the prasad (milk payasam). They get the child. Thirupullani has a close link with the epic of Ramayana. This is the place where the messengers of Ravana, Sugan and Savanan met the Lord. After the abduction of Sita, on his way to Lanka, Rama came to Thirupullani where King Dasaratha worshipped the Lord. This is the place where Rama held talks with the monkey army and built the Sethu Bridge. There are certain centers in India with special significance. Varanasi to shed the sins, Thirumanjeri for marriage alliances and Thirupullani for getting children. Sri Rama is in a lying posture in the temple. The bed is made of Darba grass where Rama gave darshan to all. Dasaratha got the Child Boon Mantra from this place only. 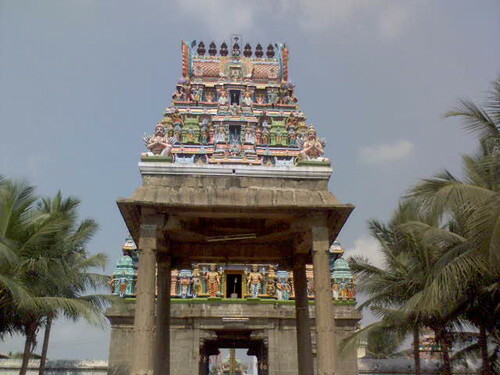 The Nagalingam installed by King Dasaratha is still preserved in this temple. The Arasu tree is also centuries old. Thirumangai Azhwar’s hymns bear the Mangalasasanam of the temple. Brammotsavam in Panguni – March-April; Sri Ramanavami in Chithirai, April-May are the important festivals celebrated in the temple. Also Vaikunda Ekadasi, Janmashtami, Pongal, Deepavali and week ends attract huge crowd to the temple. Ramanathapuram (Dist) - 623 532. Guruji refered this Temple Thirupullani for getting children. Idhikasas and puranas always suffered various modifications and changes according to convenience of mankind right from the beginning throughout the period of past generations. Many have documentary evidences and many events only through voice transmission (Sevi Vazhi Seidhigal) There cannot be direct evidence for anything and everything in Hinduism as human life itself is full of mystery and existence of God is not a proven one scientifically and it cannot be proved but it is only our faith or realisation. Because we (some people) dispute the integrity of our own history and events, quoting this and that, that is why the other people (non believers of God) propagate the Ramayana and Mahabaratha themselves as only cooked up stories. We should bear in mind that the hard copy of Ramayana or Mahabartha we have as of now are not the one which was written by the Valmiki or Vyasa or so. If Rama need not worship anybody being the supreme most lord then why did he worship or respect his father and mother or his Guru ? If the answer is that Rama, being the incornation as a human being and as a human, worshipping father and mother is not wrong, then worshipping linga is also not wrong. Both Idhikasams have left so many messages for us and we should only take them as guidance for correcting ourselves and the essence of these holy books alone holds goods for our divine life and not word by word or scenes in them. Conveniently we often forget " Ariyum Sivanum onnu.........". If we believe this we can conclude that Rama worshipped himself in the form of Linga " In the modern world also we, worshipping or respecting ourselves is described as self realization, or the oneness, as the case may be.